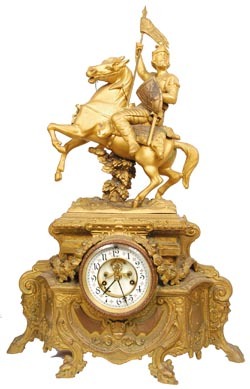 Waterbury Clock Co., figure clock, "Crusader", ca 1906. This is the same base as No. 440, different top ornament. As I previously said, the top is interchangeable. This is a classy piece with the horse and rider. Finish is dull but should clean up to show the gold gilt. Just a small place here and there where you can see the copper undercoat. This large piece is 27.25" high and 17.75" wide. Two piece porcelain dial, open escape, Rocco cast gilt sash and bezel, heavily beveled glass, all very good. The movement is 8 day, half hour gong strike. Ly-Waterbury No. 1220.